Pacific Foods Organic Almond Original Beverage takes organic almonds and adds a gentle roast to allow their authentic taste to shine through. The result is our signature taste that’s a pleasure to drink by the glass and blends perfectly in our recipes. This original almond beverage is an excellent source of riboflavin and vitamin D. This beverage is also lactose, cholesterol, soy and gluten free, is vegan, and is Non-GMO Project Verified and certified USDA-organic. For full flavor, give the container a good shake, and refrigerate after opening. 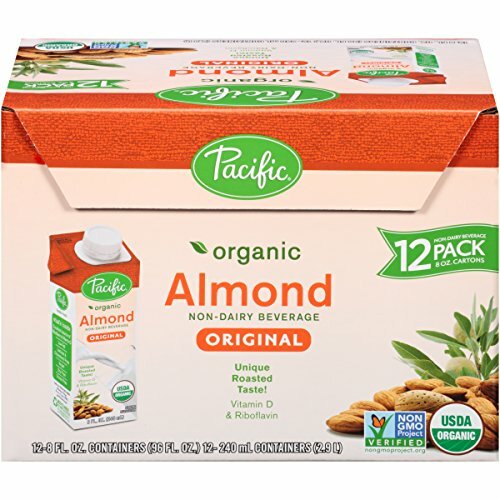 Pacific Foods Organic Almond Beverage comes in a 12-pack of 8-ounce boxes. At Pacific Foods, we believe that making foods we're proud of is as much about the ingredients we use as it is about the actual recipe. We steer clear of additives, preservatives, and avoid GMOs. The way we see it, nature knows how foods should taste, and we just try to follow her lead. Manufacturer: Pacific Foods of Oregon, Inc. Publisher: Pacific Foods of Oregon, Inc. Studio: Pacific Foods of Oregon, Inc.